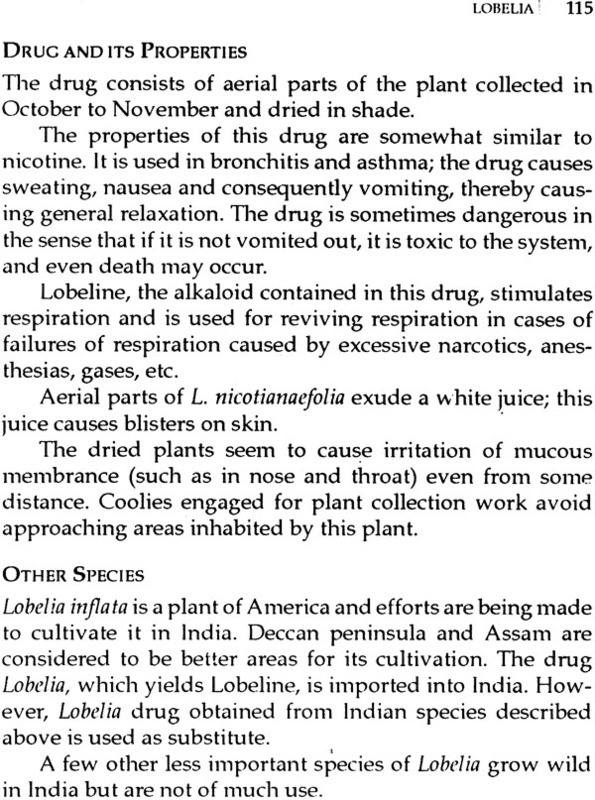 Even though reference to the curative properties of some of our indigenous herbs abound in ancient Indian texts, and also in the folklore prevailing in many parts of our country, till recent times no systematic efforts were made to subject these to dispassionate scientific scrutiny and separate fact from fiction. According to current estimates nearly three-fourths of the drugs used for curing human ailments in Indian are of plant origin. Based on his own researches in the field over a number of years and that of others before him, Dr. Jain presents in this book profiles of over 100 such plants, in our country, complete with illustrations. S.K. Jain is presently, Director, Institute of Ethnobiology, NBRI, Lucknow. He was formerly Director, Botanical Survey of India, Calcutta. He has worked extensively among certain aboriginal tribes of India to study the plants used for food, medicine, etc. he has authored several books, his most recent publication being Medicinal Plants of India (2 Volumes, published in USA, in a world series on medicinal plants), Dictionary of Indian folkmedicine and Ethnobotany, Notable plant in Ethnomedicine of India and Ethnobiology in Human Welfare. In addition, he has written many articles on medicinal herbs, floristic surveys, and plant conservation. The words medicinal herbs often lead to the thought of some miraculous and supernatural cures. Our ancient literature has references not only to plants reputed to cure difficult and incurable diseases, but also of plants related with many magical properties. For example, we read of certain seeds 'treated' with oracles (mantras) and thrown on somebody to entice him, certain roots chewed to increase longevity of life, or a few drops of juice of a plant put in the mouth of the dead to bring him back to life. In olden days, a medicine prescribed by a hermit (faqir) earned more favour and reputation than the one based on some tes t and experience. It is possible such beliefs suited the conditions and mental attitudes of those times. As times changed, and man started weighing everything on the scales of reasoning, several of earlier beliefs seemed unsound, and despite their golden past, the use of medicinal herbs declined. Today, the importance and utility of medicinal herbs are a subject more of argument and speeches, than of actual research or promotional work. Why such a situation? When developed countries were busy researching on their native plants, and exploring newer uses and newer sources of useful constituents, we only talked of our glorious past, our miracle herbs, and our wealth of past knowledge; we remained complacent. On the other hand, we welcomed the increasing numbers of Western molecular drugs with such enthusiasm that we gradually lost interest in Ayurvedic and Unani medicines of even proven efficacy. 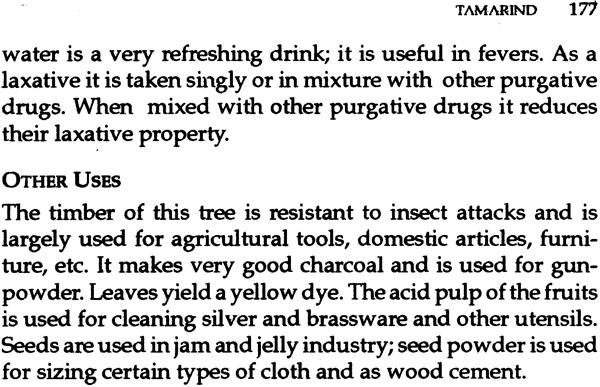 Most of us never tried to know, or even think, whether any of our medicinal plants also had real useful properties. Until about 50 years ago, few of our medicinal plants had been subjected to scientific testing and experimentation, a it was difficult to state with certainty for or against the claims of their efficacy. Whatever was once said or written was repeated, translated or adapted in subsequent publications Thus, a large amount of unreliable information crept into our medicinal plant literature, got wide circulation and became perpetuated. Some such problems are discussed in the intro duction to the book. There are a large number of big and small publications on medicinal plants of India. Most of them were written for the specialist such as the Ayurvedic practitioner, botanist pharmacologist or the pharmacist. But, there is so far no book for the kind of readership which the National Book Trust has in mind while presenting this series, India-The Land and the People. On this account the Trust deserves congratula tions for considering medicinal plants a suitable subject for that readership. A perusal of the various books published by the Trust in this series soon convinces the reader that each work is unique and so different from earlier literature on that subject. The present book deals with about 100 medicinal plants and includes only authentic information based on phar macological and other experimental work. The literature on medicinal plants is so vast and scattered that there is a possibility of some more recent reference having missed my attention, and I will gratefully welcome any useful sugges tions. The first two editions of this book received very com plimentary reviews and also some constructive suggestions. In view of this, in the second edition two new chapters were added. Thereafter, several helpful suggestions were received from reviewers and readers and efforts have been made to incorporate these in this sixth edition. The colour and line drawing illustrations have been procured from a variety of sources; for these I am grateful to the following institutions and individuals: Director, Botani cal Survey of India; Director, Publications and lnformation Directorate, C.S.I.R, New Delhi; Departments of Agriculture and Horticulture, Mysore; Botany Department, Delhi University; Dr K. Subramanyam; Sri K. Srinivasan; Dr M.A. Rau; late Dr H.B..Singh; Dr RS. Rao; DrT.A. Rao and Dr A.D. Saini. The late Dr H. Santapau had kindly gone through a large part of the manuscript and made many useful suggestions. Sri K. Kashyap, and Sri RL. Mitra have helped in some reference work. 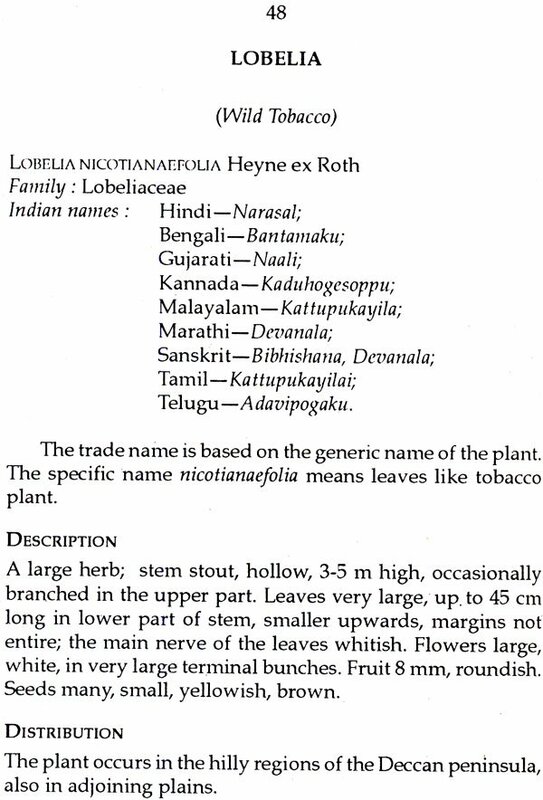 The late Sri P. Lancaster had made some valuable suggestions about uses of plants. I am grateful to all of them. I will close this brief preface with a sentence read several years ago: Nothing would ever be written if the author would wait to make his work so perfect that no improvement could be made. The history of medicine and surgery dates back perhaps to the origin of the human race. But, as no mode of recording events existed in prehistoric times, there are no data on the methods of treatment practised in that period. In those days, the subject of human suffering and its alleviation was in- timately associated with religion, myth and magic. In addi- tion, there must have been certain rational prescriptions. Whenever the curiosity of the present-day man probes into the past and brings to light even fragmentary information on the ingenious methods of our ancestors, it makes a fas- cinating study. 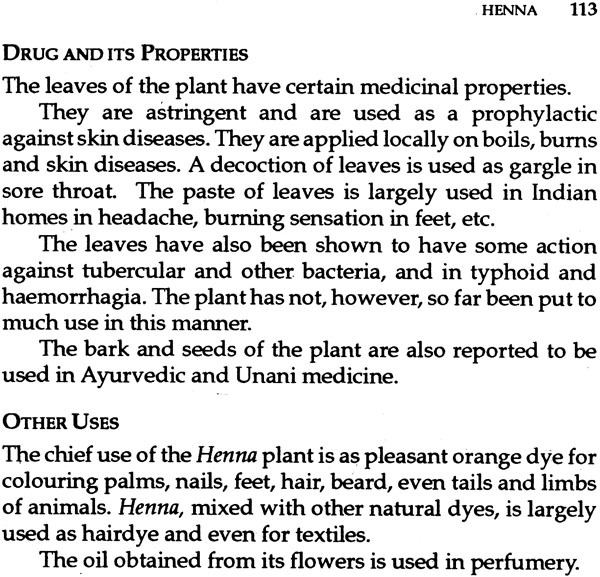 In India, the references to the curative properties of some herbs in the Rig Veda seem to be the earliest records of use of plants in medicine. The identity of several plants referred to in the Suktas of the Rig Veda can be fixed with reasonable certainty, e.g. of Semal, Pithvan, Palash and Pipal. But refer- ences to plants in the Rig Veda are very brief. A more detailed account is available in the Atharva Veda. The period of Rig Veda is estimated to be between 3500 and 1800 B.C.After the Vedas, there is no information on the development of this science in India for a period of about 1,000 years. Then appeared the two most important works on Indian system of medicine, the works of Charak and Susruta, name- ly, the Charak-Samhita and Susruta-Samhita.•The latter deals with about 700 drugs, some of these are not indigenous' to India. With the passing of time, more and more plants found entry into native medicine, taking the number of Indian medicinal herbs to about 1,500. Numerous large and small books dealing with medicinal plants of India now exist; some of them run into several volumes of hundreds of pages. The useful properties at- tributed to one and the same plant in different parts of India sometimes greatly vary; this has resulted in vast literature in regional languages too. Workers like U.c. Dutt, G. Watt, R.N. Chopra (and his associates and students) K.M. Nadkarni, KR. Kirtikar, B.D. Basu, B. Mukherjee, Chandraraj Bhandari, K. Biswas, K.P. Trivedi, the. Editors of Wealth of India (Raw Materials) and others have done very laborious work in bringing much of this information together. Some authors have compiled information without proper scrutiny of the identity of plants or of their uses and we find that some of the medicinal herbs are believed to cure practically every human disease from head to toe. References to miracle herbs or wonder drugs are often found in old literature. Voucher specimens of those plants could, of course, not be expected to be preserved by people of those times; even proper descriptions of plants are want- ing. Lack of detailed descriptions has made it practically impossible to decide the identity of those plants. The only source of reference in such cases, therefore, is the local name for the herb, or drug given in earlier works. The local names are sometimes very misleading. Cases of some local names being used for more than one herb are not infrequent. For example, two or even more than two very different plants are referred to in our literature by the names Punarnava, Brahmi, Bala, Dudhi, etc. Some workers in lndia are now trying to fix the identity of important drugs mentioned in ancient litera- ture; this will eliminate much confusion. A part from the written complete or incomplete records about ancient medicinal herbs, some knowledge on the sub- ject has also descended through generations, and. has sur- vived through times among the present-day primitive societies, i.e. among the. aboriginal tribes living in. remote forest areas. This knowledge has come through oral folklore. These studies are now classed as a specialised branch of botany, Ethnobotany. Some years ago, I initiated researches on this subject among the aborigines of central India. 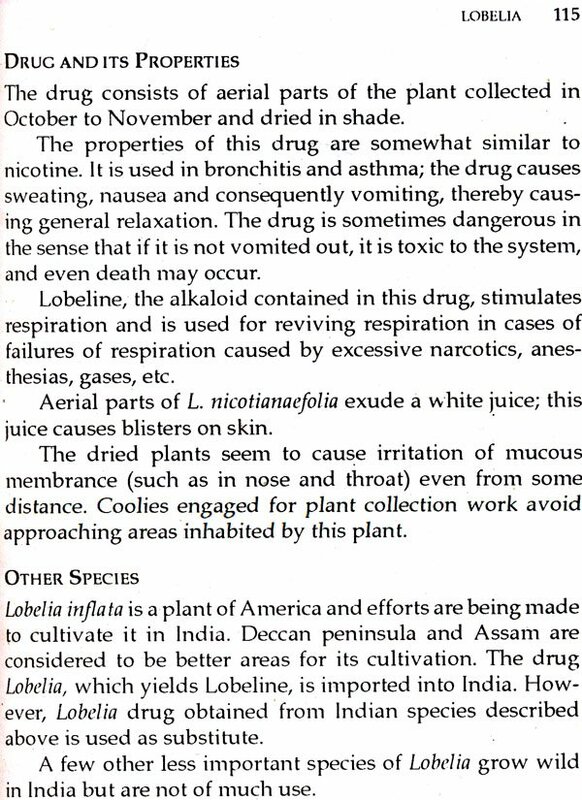 Numerous reports of medicinal uses of plants, so far unknown in litera- ture, were recorded; and interesting observations on certain plants have been included in the present work. They, how- ever, need to be scientifically tested. The question of subjecting medicinal herbs to modern scientific tests has often been raised. Clinical and phar- macological tests on alkaloids extracted from well-known and reputed medicinal herbs sometimes show distinctly negative results. Whereas, such observations should prompt us to careful and critical reassessment of these herbs, there is yet another aspect of the problem. It is possible that the efficacy of the herb depended on the total effect of the plant contents rather than on the one or few chemical fractions separated from the herb. Moreover, the time. of collection, stage of growth of plant (e. g. opened or unopened flowers, young or mature leaves, pre-or post-flowering stage), locality of natural occurrence or place of cultivation, all influence the properties of the drug. It has been estimated that out of about 2,000 drugs that have been used in curing human ailments in India, only about 200 are of animal origin and a similar number are of mineral origin. The rest, i.e. about 1,500, are of plant origin. This number is not very large considering the vast area of our country, and the wide variety of plant wealth occuring there- in. The great range of temperature (about 49°C), rainfall (from 100 mm to over 10,000 mm) and altitude (sea-level to over 6,000 m) in India account for the occurrence of over 15,000 species of higher plants in India. To select only about a hundred important ones from over 1,500 medicinal herbs posed considerable difficulty. 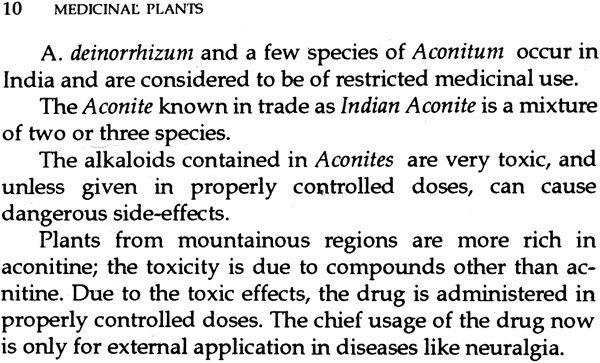 General- ly, plants whose efficacy in medicine has now been tested and recognized, for example, plants which have been included in Indian Pharmaceutical Codex and also in the British Phar- maceutical Codex and/ or United States Dispensatory have been included. Mostly, only indigenous plants have been taken. 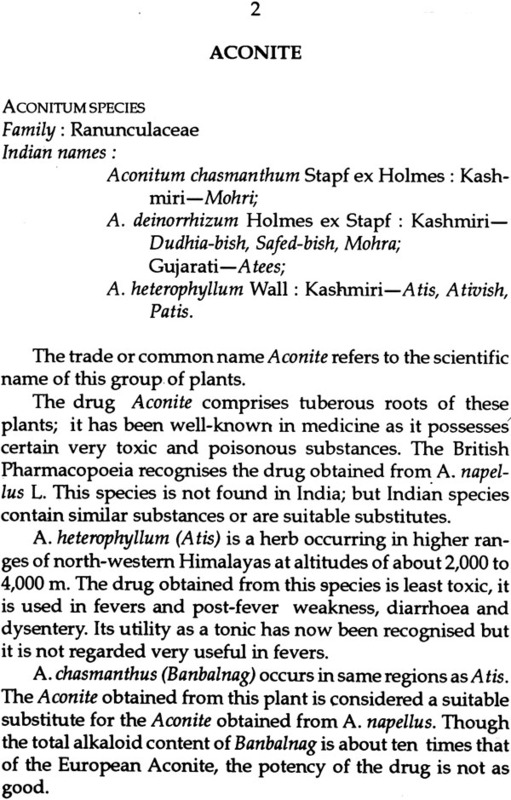 Only those few introduced species are included which are very important medicinally or commercially, or which are now regularly cultivated in India. Some such species have even become naturalised now. The trade name or some well-known common name of the drug has been given as the title of the chapter. Sometimes one or more synonymous trade names are also mentioned in parentheses. The arrangement of the chapters in the book is alphabetical by botanical names of plants. As far as possible the latest botanical names have been adopted; however, for the conveniences of the readers who may be familiar with some older names, one or two more common synonyms are given. A few names have been recently replaced by .new names. To avoid too many changes in sequence of species, index, etc., these are indicated by = sign; the name after this sign being the latest accepted name. 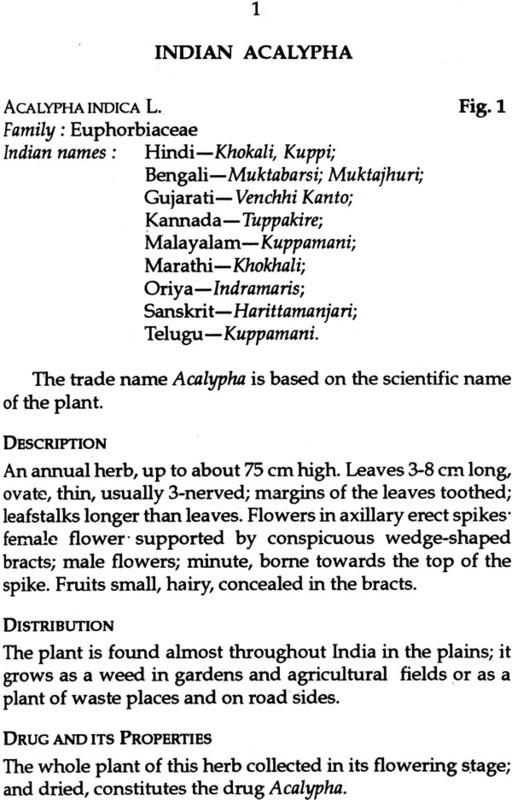 After the name of the Family of the plant, the Indian names of the plants are given. 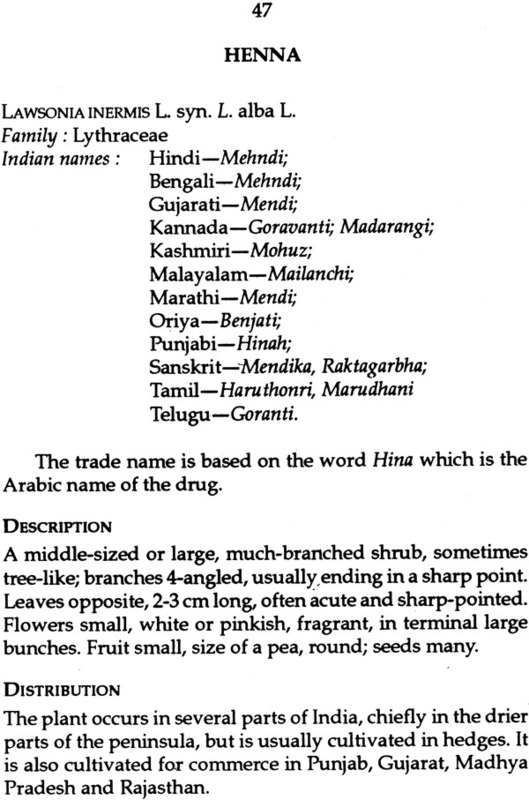 The Hindi name is given first, followed by other languages in alphabetical order. 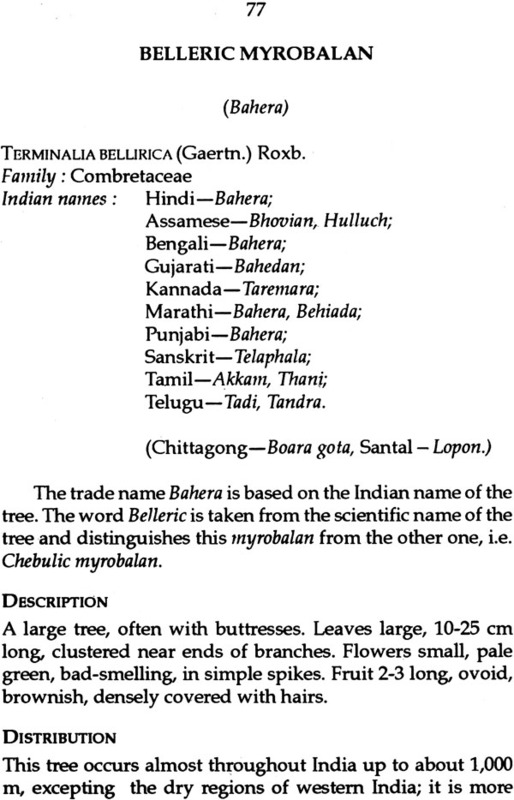 Some regional names or English names are given at the end of Indian names. The basis of the trade name or scientific name is discussed in most cases. 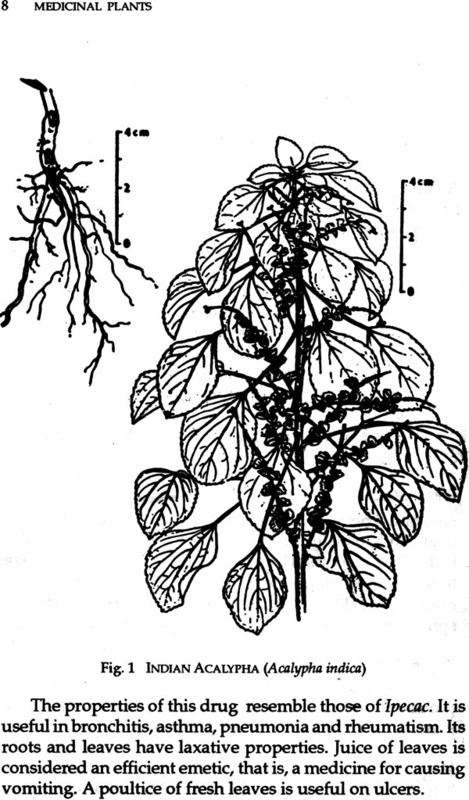 A short description of the plant is provided; those char- acteristics are mentioned which should help the reader in visualising the general structure or habit of the plant and its parts. As far as practicable, technical terms and details are avoided. It was realised that certain technical terms could be excluded only at the risk of inaccuracy of statements; these. have been retained. 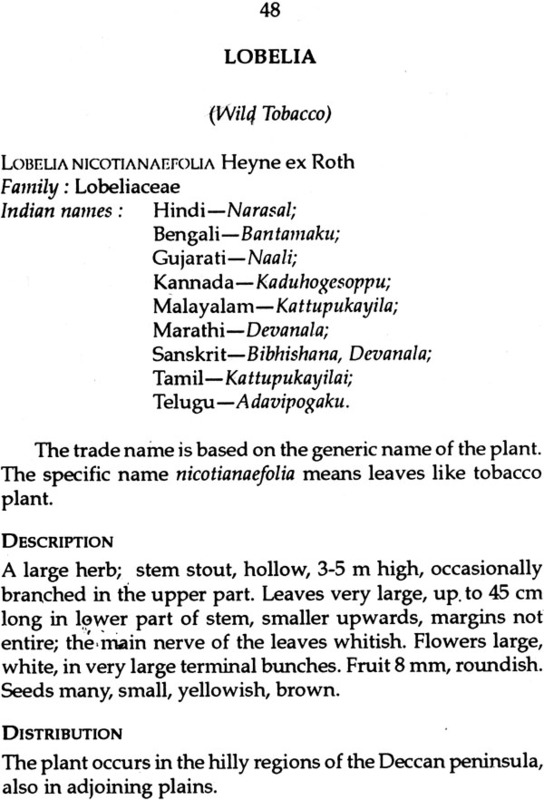 It is conventional to use 'telegraphic' language in botanical descriptions; the same has been done here. 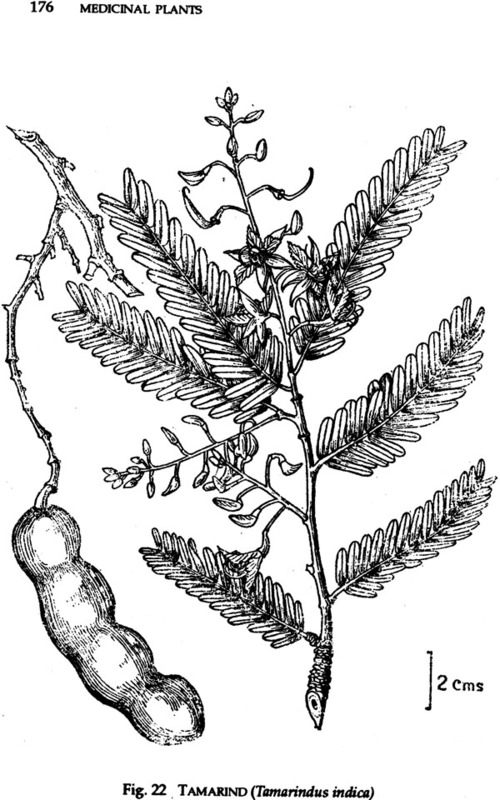 The descriptions have been based on a fairly wide range of plant specimens in herbaria. 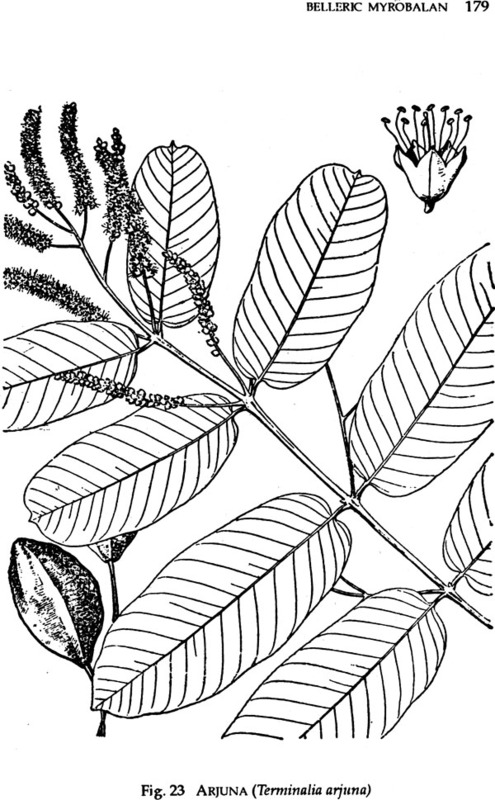 The distribution of plants in India, though a very general one, has as far as possible, been verified from herbarium materials and authentic literature. The information on Drug and its Properties has been taken from very authentic publications, and only those uses of medicinal herbs are described which have been recognised in the British Pharmaceutical Codex and/ or United States Dispensatory, or whose properties have been shown ex- perimentally on animals or in clinical tests. For this, the author took the opportunity of screening some important relevant literature of the last 30 years or so. During this literature hunt, one thing that struck him most is that phar- macological experiments or clinical tests have been done on a very small number of medicinal herbs. Intensification of such work should be the first requirement, if we have to exploit and boost up our medicinal plant resources. To familiarise the reader with other general economic importance of medicinal herbs, few sentences on timber, food and other value of the plants, under the title Other Uses, are added. In addition to the one most important species of a certain genus, mention has also been made of Other Species of that genus valued in medicine. It should be made clear that the purpose of the present work is not to prepare a book of prescriptions for different diseases, but only to apprise the reader with some of the more reputed medicinal plants of India. Many medicinal prepara- tions based on plants include products from more than one plant, and the proper proportion of different ingredients and processing, administration and doses of the drug are all very important factors in treatment of ailments. It is hoped that no reader would, of his own self, try to use any plant mentioned in the book. Different conditions need specific prescriptions, and they are the business of the specialist. It is well-known that due to the impact of other systems of medicine, particularly, lately by the rapid progress and spread of modem medicine and surgery, faith in and popularity of the herbal medicines has been gradually declining. But, there is much to say in favour of the use of native medicinal herbs or the indigenous system of med icine. This is not the place for any detailed analysis of this subject. Suffice it to say that in a country where eighty per cent of the population resides in small and often remote villages, and where per capita income is very meagre expensive, difficult to procure and complicated prescriptions cannot be a thing• of the masses.